Just a quick note to thank you very much for the wonderful day Mike and I had on Saturday. I can't explain all the emotions that Mike and I had during the shoot, but I assure you that the experience will always be remembered by the both of us. I would also like to say thank you for the SAFE environment you created and provide for the hunters. Just wanted to say hi. In case you did not get the message I left over the phone, I am going to send you guys a little thank you gift from us for showing us all such a wonderful time. My Dad said the hunt was the best hunt he has ever been on in his entire life. 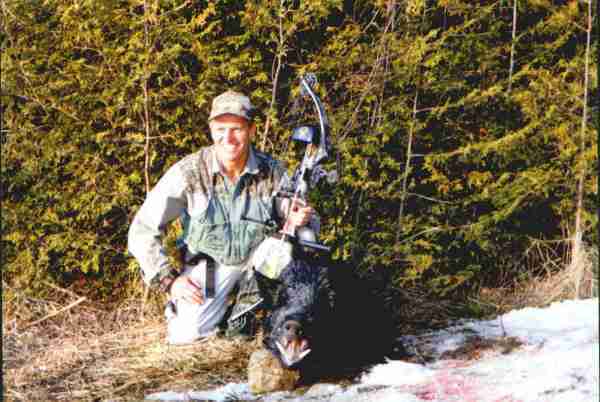 Without a doubt, a top notch hunting preserve. When you guys send us the video can you include a copy of the pictures? We will be sure to send you a copy of ours. Dad's already talking about next year, and he says he is coming with or without me. I just wanted to let you know how much we appreciated your help and hospitality. Rex, and Brian, and myself all had a great time at the hunt and the way it was handled was perfect for what we were looking for. Also I wanted to let you know that the butcher that you sent our meat to did an incredible job. We had no idea that we would have so much meat. Again we were very pleased with our experience at your facility, and we will definitely recommend your place to everyone. Again thank you for everything and if there is anything you need as far as a referral or anything at all just let me know. Thanks and enjoy the rest of your year, and holidays. Thanks for a memorable and very challenging hunt. The boars are just as you had claimed. Very, very aggressive and mean. We look forward to another hunt in the near future because we loved the challenge of hunting these aggressors with archery equipment. Thanks again for your hospitality. Thanks again for a really good time hunting on Sunday. I have left some feedback on your business site. All the pictures that we took turned out well and going through customs was a breeze. When you get tape done please send it to my home address. Thanks again for putting on a very good hunt. Thanks for the letter and picture, that was very nice of you. We all still talk about the hunt that we had with you guys and although I am already running out of meat, I think I would like to come up when the weather is a little warmer. I will definitely be back to hunt again, maybe try to take an even bigger one with my bow this time. Thanks again for the great time and we will see you again. Just got in, it's 11:30 pm Sunday night, wanna say thanks had a great time, Brett has not stopped talking about it. I don't blame him. I don't know if I would have shot it that close. Can't wait for the head and skull. I'm sure I'll see you again, maybe a hunt when I pick up head mount?? I'm sure my hunting partners or other coppers will all want to go.... Gonna have ur eggs in a.m. One more time thanks, was great...and anyone that says it's easy, give them my # for reference for sure. Already got guys interested in coming back... see u in future. SUE!!!! Where were you? I thought you wanted to meet your favorite DEAF client?? My wife and I both missed you and hope to see you the next time we come. The guys in Vegas are awestruck over the boar. They couldn't believe the boar's coat and tusks when they saw it. My friend who is a taxidermist was soooo jealous because mine looks better than his that he shot elsewhere. 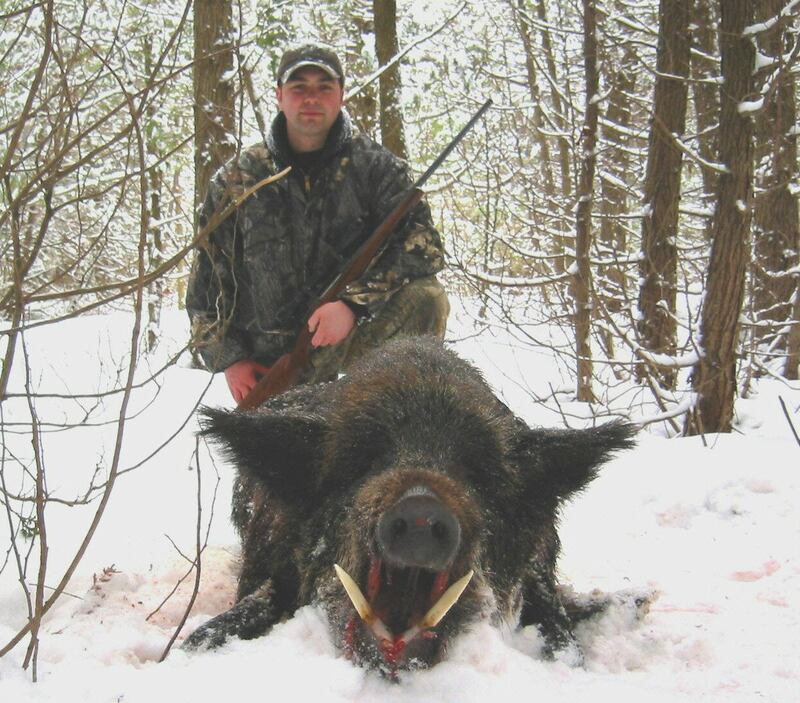 His was some so-called "feral hog" he shot. I told him his was an old farm pig with thinning hair. You will be surprised when I get the mount done. Since my wife saw the beagles, she wants one. Tony did video the hunt so when you get it edited, please email me. I am dying to see it!! I am sure Tony saw me begging for the boar to turn. Customs was a breeze to get through. The butcher did an incredible job on the meat. I had it all vacuumed wrap and it was ready by 10:30 am next day. The meat was still ice cold when we arrived back home in Vegas. If you see him again, please give him my thanks for a great job. Again, thank you for a wonderful time and all your help in dealing with all my questions. Have yourself and Tony a Happy and Safe New Year!! Thank you for the excellent hunt! I really enjoyed the outing. I took my boar to the butcher this afternoon and am looking forward to some chops on the grill. Just a short note from the boys from Ottawa (Paul, Dave, and Derrick) to thank you for a wonderful hunt and a great time. We really enjoyed ourselves. Your hospitality was outstanding and I hope you found us safe and responsible hunters. We all look forward to seeing you and doing it again!